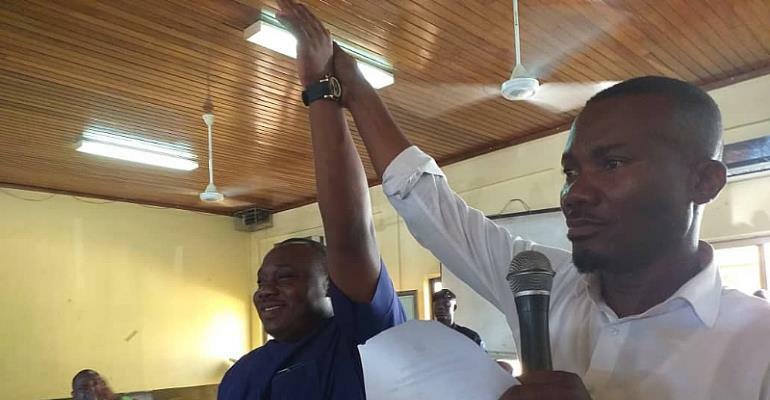 Despite the purported discontent shown by some people believed to be members of his own party -the New Patriotic Party, over his nomination, the MCE nominee for the Keta Municipal Assembly, Mr. Godwin Edudzi Effah has been given an overwhelming endorsement by members of the Assembly on Monday. The nominee, pulled 28 votes, from a total of 30 votes cast by members of the Assembly, which translates into a 93.3 per cent endorsement. Mr. Godwin Edudzi Effah, by the confirmation, has been sworn in as the substantive Municipal Chief Executive for the Assembly, replacing Mr. Seth Yormewu, who has been moved to the newly created Anloga District Assembly. His confirmation follows the election of a Presiding Member for the Assembly, which took place earlier in the morning of Monday. Hon. Wilson Kofi Bonuedie, the only candidate, also secured a similar result of 28 'Yes' votes, from a total of 30 votes cast, to become the Presiding Member for the Assembly. Prior to the opening of polls, the Volta regional Minister, Dr. Yao Archibald Letsa, who was in attendance with other party stalwarts, in a short message to the Assembly members, asked them to give the nominee a total confidence of support and acceptance, by delivering a hundred percent endorsement, just as it was done in the other new districts. "Just as I represent the President in the Volta region, and some few more days in Oti [comic], Mr. Godwin Edudzi Effah, would be the representative of the President here in the Keta Municipal Assembly. But our laws require he is approved by the honourable members of the Assembly. So we are here." "The President has asked me to plead with you, to approve his nominee by 100 per cent. I want us to do that, because if we don't do that, you're going to put me to shame." The new MCE, Mr. Godwin Edudzi Effah, is a native of Keta and had his basic education at the Keta Dzelukorpe E.P Basic School and the Anlo Technical Institute (Secondary). He had his first degree in Bachelor of Commerce, from the University of Cape Coast, and his MBA in Accounting in the same University, in a later year.